Lyoto “The Dragon” Machida is a UFC superstar and icon in the world of MMA. 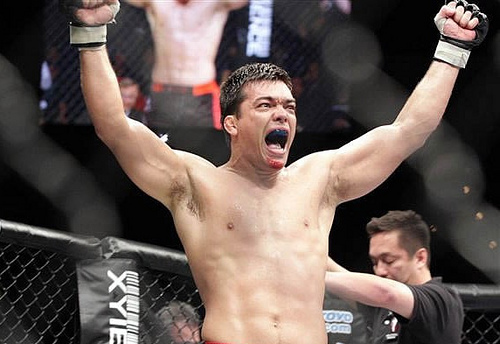 The Japanese-Brazilian professional mixed martial arts fighter and son of a Japanese-Brazilian Shotokan karate master Yoshizo Machida, Lyoto is considered by many to be the most talented fighter of the UFC. The Dragon is currently a favorite to become the Middleweight Champion of the world having fought mostly as a light heavyweight previously. In 2009 he won the UFC light heavyweight title by defeating Rashad Evens in near perfect fashion. He is the 1st UFC fighter to win a title with a perfect record (16-0). Leading up to his title he secured victories over talented opponents such as Tito Ortiz, Rich Franklin, B.J. Penn, Rameau Thierry Sokoudjou, Stephan Bonnar, Thiago Silva, and Sam Hogar. Machida is noted for his semi-orthodox fighting style, known as Machida Karate. As a karate practitioner, Machida uses an unorthodox (or southpaw) stance and relies on quickness and perfect technique. Machida currently fights out of the Machida Dojo in Belem, Brazil while living in the South Bay near Los Angeles. He trains with such fighters as UFC Middleweight champion Anderson Silva, former UFC Light Heavyweight champion Vitor Belfort, and Antonio Rodrigo Nogueira.